Indiana (IN): Parke County, the “covered bridge capital of the world” (Burr Arch Truss, Mecca, Narrows, and Bridgeton Covered Bridges, Turkey Run State Park); beautiful Cataract Falls State Recreation Area and its 1876 Covered Bridge; Indianapolis Zoo animals; Conner Prairie Interactive History Park. Michigan (MI): Pictured Rocks National Lakeshore, Munising Falls, Porcupine Mountains Wilderness State Park, Presque Isle River potholes, spinning foam cake, birch bark patterns, William Mitchell State Park, Lake Mitchell, Cadillac. Minnesota (MN): snow and water drops on orange, red, and yellow maple leaf color. Missouri (MO): Gateway Arch in Jefferson National Expansion Memorial, St. Louis. 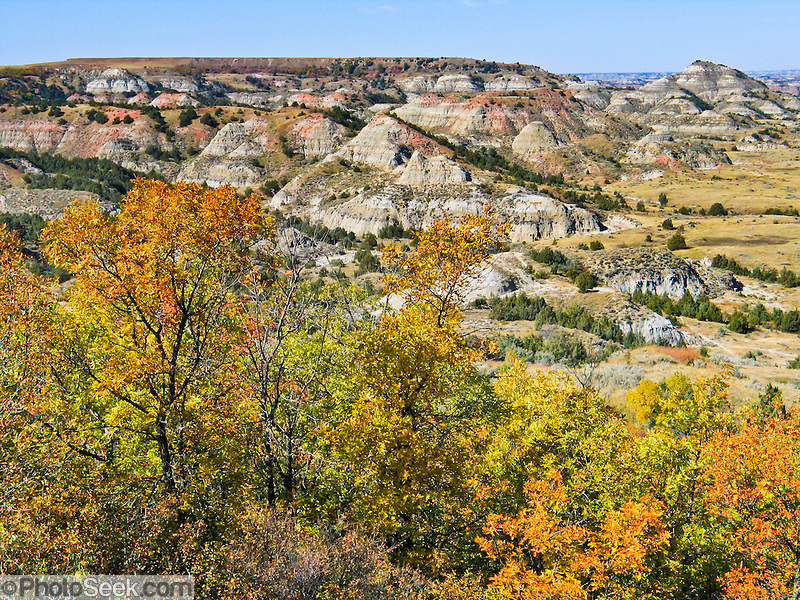 North Dakota (SD): Theodore Roosevelt National Park South Unit: badlands with fall colors. South Dakota (SD): Badlands National Park, bighorn sheep, Mount Rushmore National Memorial, Custer State Park and wildlife reserve. Parke County, Indiana, is the “covered bridge capital of the world.” View fascinating Turkey Run State Park: Sugar Creek, Rocky Hollow Falls Canyon Nature Preserve, surprisingly scenic narrow (almost slot) canyons, boardwalks, hikers’ suspension bridge, and the 1841 Lusk Home. Covered Bridge photos include Bridgeton, Crooks, McAllister’s, Neet, Thorpe Ford, Roseville, Mecca, Narrows, and Cox Ford bridges. See the Case 1822 log cabin in Bridgeton Historic District, Parke County Courthouse in Rockville, and an orange sunset with silhouetted tree. I was fascinated by Turkey Run State Park in historic Parke County. Bear Hollow Canyon is surprisingly scenic and narrow (almost like a slot). Rocky Hollow Falls Canyon Nature Preserve is a National Park Service Registered Natural Landmark. Fun trails include boardwalks, stairs and ladders. See Sugar Creek Suspension Bridge. Cox Ford Covered Bridge was built in 1913 over Sugar Creek. The historic Lusk Home was built in Federal and Greek Revival style starting in 1841. Inside the Dolphin Pavilion, admire these sea-going mammals from the intimate underwater viewing dome in the center of the main performance pool. The Atlantic Bottlenose Dolphin (Tursiops truncatus) is also known as the Common Bottlenose Dolphin. East African Crowned Crane (or Crested Crane, Balearica regulorum gibbericeps). Addra Gazelle (Nanger dama), the world’s rarest gazelle. White rhinoceros or square-lipped rhinoceros (Ceratotherium simum). Photos from Michigan include: Presque Isle River potholes, cool geology along Lake Superior shoreline, Porcupine Mountains Wilderness State Park, Lake of the Clouds, birch bark patterns, fall foliage colors, Pictured Rocks National Lakeshore (Miners Castle, Sable Falls, Munising Falls, rounded pebbles), William Mitchell State Park, and Lake Mitchell, Cadillac. Photos from Minnesota include: snow falling on late September fall foliage colors in Superior National Forest, Two Steps Falls, Baptism River, Tettegouche State Park, peeling tree bark pattern, water drops on maple leaves, Lake Superior, Temperance River State Park, and watermelon, squash, and pumpkin harvest at farmers’ markets. Badlands, Theodore Roosevelt National Park South Unit, in the Great Plains along Interstate 94 near Medora, North Dakota, USA. South Dakota’s largest and first state park was named after Lt. Colonel George Armstrong Custer. Completed in 1922, the Needles Highway includes sharp turns, low tunnels and impressive granite spires along the northern 14 miles of South Dakota Highway 87 (SD 87). The road lies within Custer State Park, 30 miles south of Rapid City, in South Dakota. Needles Highway is part of the figure-eight route of Peter Norbeck National Scenic Byway. A magical sunrise warmed the freezing air over idyllic Sylvan Lake. Cathedral Spires Area is most impressive. A famous herd of 1500 bison freely roam the Park, as seen along Wildlife Loop Road.